Germania (/dʒərˈmeɪniə/) was the Roman term for the geographical region in north-central Europe inhabited mainly by Germanic peoples. It extended from the Danube in the south to the Baltic Sea, and from the Rhine in the west to the Vistula. 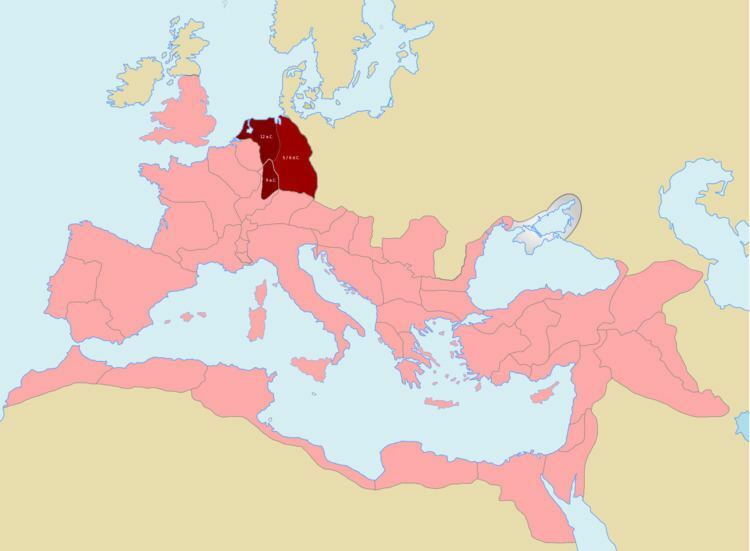 The Roman portions formed two provinces of the Empire, Germania Inferior to the north (present-day Netherlands, Belgium, and western Germany), and Germania Superior to the south (Switzerland, southwestern Germany, and eastern France). Germania was inhabited mostly by Germanic tribes, but also Celts, early Slavs, Balts and Scythians. The population mix changed over time by assimilation, and especially by migration. The ancient Greeks were the first to mention the tribes in the area. Later, Julius Caesar wrote about warlike Germanic tribesmen and their threat to Roman Gaul, and there were military clashes between the Romans and the indigenous tribes. Tacitus wrote the most complete account of Germania that still survives. The origin of the term Germania is uncertain, but was known by Caesar's time, and may be Gallic in origin. For the rest, they affirm Germania to be a recent word, lately bestowed. For those who first passed the Rhine and expulsed the Gauls, and are now named Tungrians, were then called Germani. And thus by degrees the name of a tribe prevailed, not that of the nation; so that by an appellation at first occasioned by fear and conquest, they afterwards chose to be distinguished, and assuming a name lately invented were universally called Germani. Names of Germany in English and some other languages are derived from "Germania", but German speakers call it "Deutschland", and Dutch speakers call it "Duitsland", both from *þeudō "people or nation" (see Teutons). Several modern languages use the name "Germania", including Hebrew (גרמניה), Italian (Germania), Albanian (Gjermania), Bulgarian (Германия), Maltese (Ġermanja), Greek (Γερμανία), Macedonian (Германија), Romanian (Germania), Russian (Германия), Armenian (Գերմանիա) and Georgian (გერმანია). Germania extended from the Rhine eastward to the Vistula river, and from the Danube river northward to the Baltic Sea. According to Friedrich Engels in his book The Origin of the Family, Private Property and the State (first published in 1884) Germania covered an area of 500,000 km2 or 190,000 sq mi and had a population of 5,000,000 in the 1st century BC. The areas west of the Rhine were mainly Celtic (specifically Gaulish) and became part of the Roman Empire in the first century BC. The Roman parts of Germania, "Lesser Germania", eventually formed two provinces of the empire, Germania Inferior, "Lower Germania" (which came to eventually include the region of the original germani cisrhenani) and Germania Superior (in modern terms comprising an area of western Switzerland, the French Jura and Alsace regions, and southwestern Germany). Important cities in Lesser Germania included Besançon (Besontio), Strasbourg (Argentoratum), Wiesbaden (Aquae Mattiacae), and Mainz (Mogontiacum). The geography of Magna Germania was comprehensively described in Ptolemy's Geography of around 150 C.E. via geographical coordinates of the main cities. By means of a geodetic deformation analysis carried out by the Institute of Geodesy and Geoinformation Science at the Technical University of Berlin as part of a project of the German Research Association under the direction of Dieter Lelgemann in 2007–2010, many historical place names have been localized and associated with place names of the present day. Germania was inhabited by different tribes, most of them Germanic but also some Celtic, proto-Slavic, Baltic and Scythian peoples. The tribal and ethnic makeup changed over the centuries as a result of assimilation and, most importantly, migrations. The Germanic people spoke several different dialects. Classical records show little about the people who inhabited the north of Europe before the 2nd century BC. In the 5th century BC, the Greeks were aware of a group they called Celts (Keltoi). Herodotus also mentioned the Scythians but no other tribes. At around 320 BC, Pytheas of Massalia sailed around Britain and along the northern coast of Europe, and what he found on his journeys was so strange that later writers refused to believe him. He may have been the first Mediterranean to distinguish the Germanic people from the Celts. Contact between German tribes and the Roman Empire did take place and was not always hostile. Recent excavations of the Waldgirmes Forum show signs that a civilian Roman town was established there, which has been interpreted to mean that Romans and Germanic tribesmen were living in peace, at least for a while. Caesar described the cultural differences between the Germanic tribesmen, the Romans, and the Gauls. He said that the Gauls, although warlike, could be civilized, but the Germanic tribesmen were far more savage and were a threat to Roman Gaul and so had to be conquered. His accounts of barbaric northern tribes could be described as an expression of the superiority of Rome, including Roman Gaul. Caesar's accounts portray the Roman fear of the Germanic tribes and the threat they posed. The perceived menace of the Germanic tribesmen proved accurate. The most complete account of Germania that has been preserved from Roman times is Tacitus' Germania. Some Germani, perhaps the original people to have been referred to by this name, had lived on the west side of the Rhine. At least as early as the 2nd century BC this area was considered to be in "Gaul", and became part of the Roman empire in the course of the Gallic Wars (58–50 BC). These so-called Germani cisrhenani lived in the region of present-day eastern Belgium, the southeastern Netherlands, and stretching into Germany towards the Rhine. During the period of the Roman empire, more tribes settled in areas of the empire near the Rhine, in territories controlled by the Roman Empire. Eventually these areas came to be known as Lesser Germania, while Greater Germania (Magna Germania; it is also referred to by names referring to its being outside Roman control: Germania libera, "free Germania") formed the larger territory east of the Rhine. The Germania of Caesar and Tacitus was not defined along linguistic lines as is the case with the modern term "Germanic". The Romans knew of Celtic tribes living in Magna Germania (Greater Germania), and what we now term Germanic tribes living in Gaul, then a predominantly Celtic region. It is also not clear that they distinguished the tribes into linguistic categories in any exact way. The language of the Germani Cisrhenani and their neighbours across the Rhine is still unclear. Their tribal names and personal names are generally considered Celtic, and there are also signs of an older Belgic language which once existed between the contact zone of the Germanic and Celtic languages. Germania in its eastern parts was likely also inhabited by early Baltic and, centuries later, Slavic tribes. These parts of eastern Germania are sometimes called Germania Slavica in modern historiography. The occupied Lesser Germania was divided into two provinces: Germania Inferior (Lower Germania) (approximately corresponding to the southern part of the present-day Netherlands) and Germania Superior (Upper Germania) (approximately corresponding to present-day Switzerland, South West Germany and Alsace). The Romans under Augustus began to conquer and defeat the peoples of Germania Magna in 12 BC, having the Legati (generals) Germanicus and Tiberius leading the Legions. By 6 AD, all of Germania up to the River Elbe was temporarily pacified by the Romans as well as being occupied by them. The Roman plan to complete the conquest and incorporate all of Magna Germania into the Roman Empire was frustrated when Rome was defeated by the German tribesmen in the Battle of the Teutoburg Forest in 9 AD. Augustus then ordered Roman withdrawal from Magna Germania (completed by AD 16) and established the boundary of the Roman Empire as being the Rhine and the Danube.